Follow these steps to embed a Qualtrics Form into a Kentico page. 1. 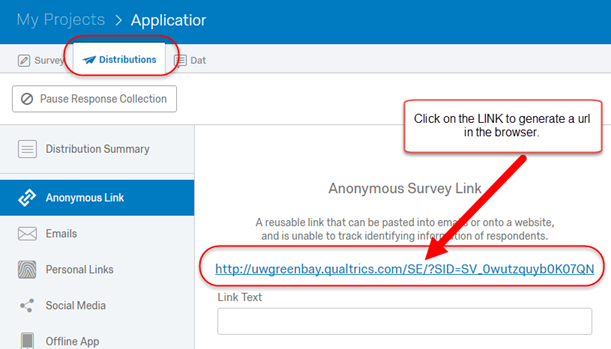 Open Qualtrics and within the "Distribution" area, create an "Anonymous Link". Click on the link to open the Qualtrics form in a browser. 2. Copy the link to the clipboard. *You will be inserting this url into a Qualtrics Widget within Kentico. 3. Open Kentico, create or a new page or Check Out an existing page. In 'edit' mode, insert a Qualtrics widget. 4. The only widget properties needed are the Qualtrics url (paste from the clipboard) and a height. (height is debatable, anything from 1200 to 2400 appears to work fine.) Finally, click on Save and Close. 5. Preview the page. Check In and Submit for Publishing. *If you wish to edit the form, highlight the widget and click to open.